You’ll recall that in earlier posts at this blog we’ve defined “stakeholders” as individuals, groups, and organizations it makes sense to build and maintain relationships with because something important is at stake. For example, the office of the mayor and board of county commissioners in your region are always primo stakeholders whose political – and often financial – support are tremendously important to your authority. Over my 30 years of work with public transit CEOs and their boards I’ve come across more than one case of poorly planned and managed stakeholder engagement. This is really unfortunate since the support of key stakeholders is critical to an authority’s thriving and growing in these challenging times, when people tend to be not only tax-adverse, but also highly skeptical about the motives and capability of public sector organizations. I’m reminded of an egregious example of botched stakeholder relations I encountered some five years ago. This transit authority had established a high-level business advisory committee consisting of executives representing both large corporations and small businesses. Saddled with a vague charge and unclear role and provided with minimal staff support, the committee suffered through four to five meandering, unproductive meetings before imploding, damaging the authority’s credibility with the business community. 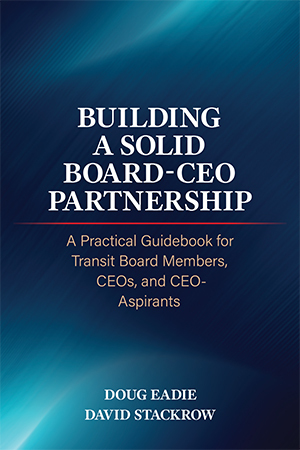 In my professional opinion every transit CEO, wearing her Connecter-in-Chief hat, should not only ensure that relationships with important stakeholders are well-managed, but also play a strong personal role in handling the highest-stakes relationships. I also recommend that transit authorities follow the lead of the Central Ohio Transit Authority (Columbus) in focusing on stakeholder relations in their annual strategic planning and governance retreats. One of the breakout groups at COTA’s High-Impact Governing Work Session in June 2017, for example, identified a number of major stakeholders in the Columbus region and assessed the highest-priority stakeholder relationships. And following up on this session, the COTA Board created a new standing committee, External/Stakeholder Relations, whose charge includes fashioning strategies to build and maintain key stakeholder relationships. 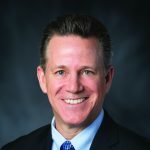 The podcast that David Genova, General Manager and CEO of the Regional Transportation District – Denver, CO, recorded for this blog provides us with a case of exemplary stakeholder relationship management: its Pass Program Study Working Group. Among the factors that made this foray into stakeholder relations so successful, according to Dave, are: a highly diverse working group in terms of geographical location, professional affiliations, perspectives, etc. ; clear, detailed direction from the RTD Board of Directors, including “guiding principles” and specific objectives; strong executive-level staff support; a consensus approach to decision-making that involved considerable comprising; and close CEO oversight, although Dave was not directly involved in Working Group deliberations. We’ll want Dave to record a part-two podcast, bringing us up to date on actions that have resulted from the Working Group’s report to the RTD Board. Meanwhile, be on the lookout for the next podcast in this series on transit stakeholder relations, featuring Jeff Arndt, President/CEO of VIA Metropolitan Transit in San Antonio, Texas.